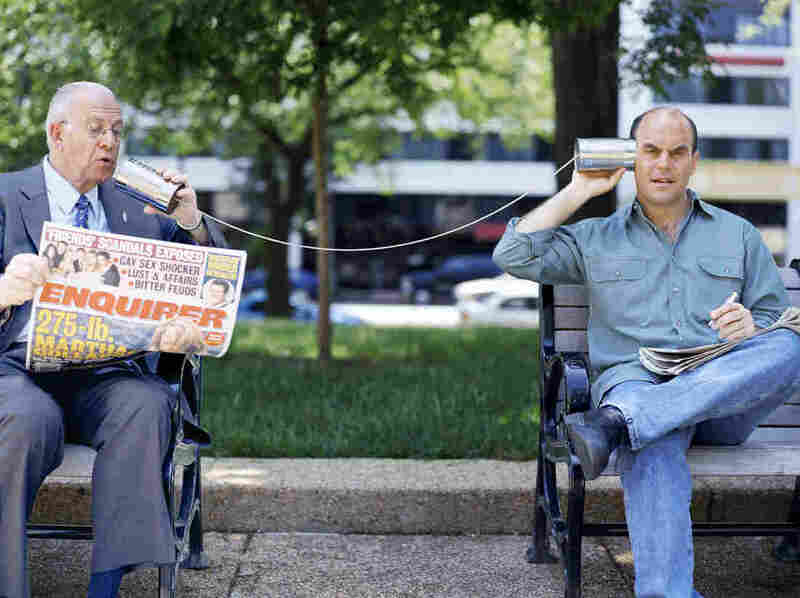 Peter Sagal: Carl Kasell 'Was Kind Down To His Bones' In the 16 years they worked together, Wait Wait... Don't Tell Me! host Peter Sagal can't remember the longtime NPR newscaster having a sharp word for anyone. Ever. Kasell died Tuesday at age 84. On Tuesday we lost a colleague. Carl Kasell (left) was an NPR newscaster for decades and then became judge and official scorekeeper for Wait Wait... Don't Tell Me! He died from complications of Alzheimer's disease at age 84. Wait Wait host Peter Sagal (right) says he loved how much Carl enjoyed himself. The day I met Carl Kasell, in 1998, he just reached out and shook my hand and said my name. And then he said it again. I think he knew how exciting it is for all of us public radio nerds to hear your name, spoken by that voice, and he wanted to give me a gift. I met Carl when he was in his early 60s, already an institution in the news business, at an age when he could think about retiring. But instead, he started a second career. Carl became the official judge and scorekeeper for Wait Wait... Don't Tell Me! We needed him on the show because if Carl Kasell was involved, it was serious, it was important, it was NPR! In fact, for almost 20 years, the only prize we ever offered on our show was Carl's voice, on the winner's voice mail. But as soon as he had the chance, Carl dropped his serious newsman persona, because what he really was, and really wanted to be, was funny. Carl was born and raised in North Carolina and could turn on that Southern charm at will, with time for everyone, and never a sharp word to anyone, ever, not once in the 16 years I knew him. He was kind down to his bones. He was a devoted and loving husband to his first wife, who died right before I met him. A few years later he met Mary Ann Foster, who loved adventure and travel just as much as he did — which he knew because they met in front of the monkey cage at the London Zoo. For a wedding present to themselves, Mary Ann bought them matching kayaks, which they used going up and down rivers in Virginia when they weren't traveling the world. And wherever he went, Carl told me with some delight, people would recognize him. And upon request, he'd say their name. But of all the reasons I loved him, the most important was how much Carl enjoyed himself. He was a born broadcaster, who loved his audience just as much as they loved him. Carl never shied away from a joke, when there was one to be made. He presided over his last episode of Wait Wait in 2014. I told the crowd at the Warner Theatre that night that we wanted to send Carl out by simply doing a good radio show. To which Carl replied, "Why start now, Peter?" Post by Wait Wait Don't Tell Me. Not long ago, Wait Wait taped a show at the Wolf Trap outdoor amphitheater in Virginia and the audience was overjoyed to learn Carl was in attendance. He was grateful for every day he was able to speak to you. And we were grateful for every day we got to spend with him.